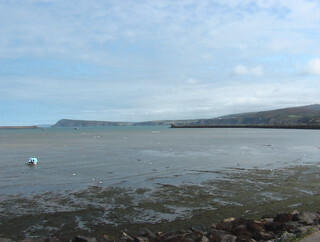 Harbouring change: a view of the harbour at Goodwick, Fishguard. Stena Line’s ferry terminal is out of shot to the right. Stena Line have today introduced a new ferry timetable which has played a part in the start of a new chapter for the Great Western Railway. Apparently, the ferry timetable between Fishguard and Rosslare has remained largely unchanged for decades. Today however all four departures have been shifted by at least an hour, some almost as many as three. Arriva Trains Wales (ATW) have, for their part, reworked the Fishguard rail timetable to ensure rail connections are available. However, they have been forced to breach the terms of their original 2003 franchise agreement. 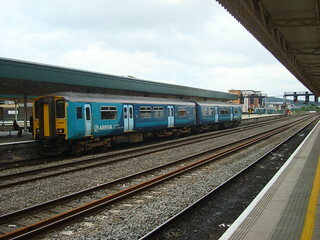 That contract required only two trains per 24 hours, and specified that these must run between Fishguard and Swansea (or Cardiff), connecting with ferries and either running through to/from London or connecting with London services. Obviously, so far ATW have opted to connect with First Great Western services to and from London Paddington rather than run through services themselves. In light of Stena Line’s changes however, the London connections required by the 2003 franchise agreement are no longer provided. One of the ferries now arrives at Fishguard Harbour fairly late in the evening; by the time the connecting train reaches Swansea or Cardiff the last train to London would be long gone with the first morning train to London not due for nearly four hours, thus breaching the terms of the 2003 contract. 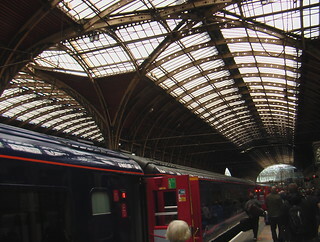 Link Lost: London Paddington (pictured) is no longer be reachable from one of the two ferries from Rosslare to Fishguard. In fairness to ATW, the London service no longer appears to be a reasonable requirement given Stena’s new ferry timing, unless I have misinterpreted the franchise agreement the only way ATW could possibly comply would be to either run through to London themselves (and their staff probably don’t have the required route knowledge) or somehow make First Great Western provide an additional service in the middle of the night. The departure time from Cardiff would be about 1am and arrival in Paddington about 4am (or slightly earlier if First Great Western, using a 125mph train, ran the service). Meeting that requirement would therefore cost a lot of money for very little gain (is anyone likely to find a service at such unsociable hours useful?). ATW cannot be let off the hook completely however, since another aspect of their changes also appears to breach the franchise agreement. 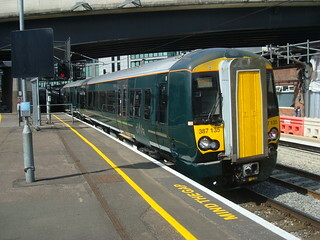 The new rail timetable shows that the problematic evening train, which couldn’t connect into a London service, terminates at Carmarthen, without even a connection to Swansea. That, according to the 2003 franchise agreement, is clearly a breach of contract; through services to at least Swansea are mandatory. Since publishing their timetable, it seems ATW have realised this and the Real Time Trains website is now showing that the new evening boat train, the 22:14 from Fishguard Harbour, will run through to Swansea after all. It will terminate there at 00:04. The 21:58 arrival at Fishguard Harbour however, which would connect into the overnight ferry, is now shown online as starting from Carmarthen at 21:03, thus involving a change for passengers from Swansea and Cardiff and breaching the 2003 agreement. That is also a change from ATW’s PDF timetable leaflet, which suggests the service would start from Manchester Piccadilly at 15:30 (with a suspicious instantaneous reversal in Carmarthen station). Lost train: the Fishguard boat train about to leave Cardiff at 10:57, a service which did not call at Swansea. From today this working is replaced by a service from Swansea to Fishguard, so not only will passengers have a slower route they will also have to change at Swansea. It isn’t only the timetable that isn’t clear, ATW’s current contractual commitments are also shrouded in mystery. 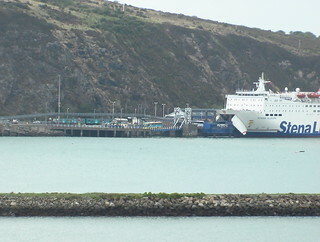 Although the 2003 franchise agreement is available online, the contract for the additional Fishguard services introduced in 2011 is not. For this post, I attempted to gain a clear picture by submitting a freedom of information request for the 2011 contract. My request was refused on the grounds of commercial confidentiality. We therefore cannot be sure if the Arriva are allowed to use the local services that do not connect with ferries to meet requirement for services to run through to/from Cardiff or Swansea, and we don’t know if reducing Fishguard’s train service from 7 trains each way (per 24 hours) to 6 (the 01:50 overnight service is withdrawn now that the sailing it existed to connect with is no more). The future now arriving: class 387 electric unit at London Paddington. Stena’s unprecedented changes are not today’s only shock to the established Great Western status quo. You will also get a shock, a potentially lethal one, if you touch the overhead wires on several sections of the Great Western main line, including between Paddington and Maidenhead. There, class 387 Electrostar electric multiple units have become the first electric trains to carry fare-paying passengers on a section of line electrified under the current Great Western electrification project. Sections further west have been live for testing purposes for some time, but cannot be used for passenger services yet due to gaps in the overhead line between them and Maidenhead.